Located right outside of the medina, but close enough so that you can walk to Jemaa El Fnaa square, The Royal Mansour Hotel in Marrakech is truly unique. These are not typical hotel rooms: each accomodation is its own luxurious riad, the smallest being over 1500 sqft, complete with three floors and a roof terrace with plunge pool. The service is unbelievably good, with incredible dining options (dinner at La Grande Table Marocaine was the best meal that I had during my entire trip. Also, their dim sum lunch was better then many I have had in China). The spa is stunningly beautiful and the treatments are absolutely fantastic. Visiting the main medina in Marrakech is an iconic experience (although it may be a bit overwhelming) and definitely a must see at some point during your stay. One night, after dinner within a private local riad, I rode as a passenger on a moped through the tiny streets of the medina. It was so much fun, exhilarating and a great way to experience the livelihood of the city. Another great hotel option in Marrakech is La Mamounia, which is more of a buzzy “see and be seen” place with a resort feel – very fashionable/chic and has a lot of history, but Royal Mansour is still the highest end and a place to get away. A visit to the Jardin Majorelle, YSL’s private gardens (which have long been a celebration of Berber culture–not to mention exotic plants) is a must. It has also just become home to one of two new YSL Museums. For a delicious, traditional Moroccan tagine, I recommend dining at La Maison Arabe. For shopping – 33 Rue Majorelle in Marrakech is great. Norya Ayron is a local designer with a store in the medina. In her namesake boutique she sells beautiful silk and cotton kaftans and jumpsuits. The food served at Dar Ahlam is light, healthy and super fresh. Everything is included when it comes to food (and activities in the area) and there are no set meal times. Every day you dine in a different location – whether it’s breakfast in their beautiful gardens, a luxurious lunch along a river bed where you can eat while dipping your feet into the water, or dinner at a nearby gorge complete with candles. No matter how long you stay, you will never have a meal in the same place twice. There are no TVs or telephones in the rooms – if you need anything you go to the common library where the staff is at your service. It’s all about truly immersing yourself in the environment. When planning your day, you may consult with the activity “Dream Coordinator” who organizes the days events based on a guests individual interests. Wanting to see how local people live? They may take you to an authentic market in a town where there are no tourists. Into hiking? They will take you into the mountains for a day to hike scenic trails. 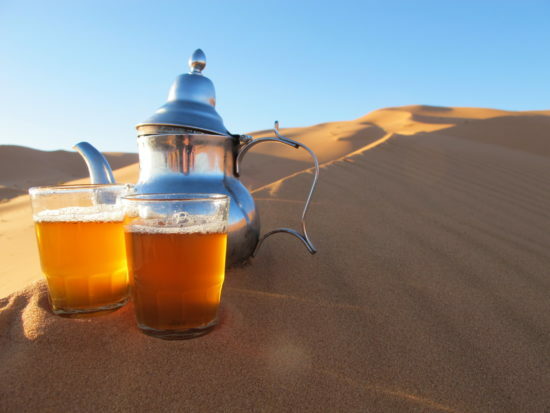 For an extra cost you can spend a night in the desert in their tented camp in Merzouga, which is really special. They have a new concept at Dar Ahlam called “The Memory Road” (la route du Sud). For 6 nights you are guided off of mainstream routes and you stop for a night each at three houses built specifically for the team at Dar Ahlam. Then spending one night in their tented camp, ending with two nights at Dar Ahlam. Instead of using your luggage, they unpack your belongings and place everything into an old fashioned travel trunk so you truly feel like you’ve stepped back in time and are exploring the Sahara. This is a really unique experience and perhaps not for someone who needs Four Seasons level amenities at every turn. But for those who are adventurous and appreciate personalized service and immersing themselves in the local culture, it is fantastic. On my last trip to Morocco I went to Fes which was truly magical. 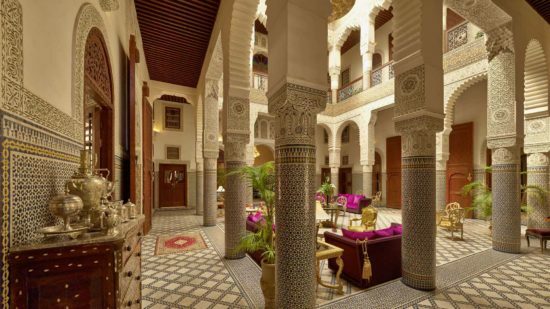 The hotel, Riad Fes, a Relais Chateux property, is gorgeous. The atmosphere is so romantic, from the entrance into the inner courtyard with a candle lit reflection pool where traditional live Moroccan music is played to the gorgeous rooftop bar with 360 degree views of the city. I recommend having a drink on the rooftop at sunset before dining in the on site restaurant, which is fantastic. For something more boutique, Palais Amani is lovely and very well hidden down a small local street. The rooms all circle around the large, open air courtyard where breakfast is served. Definitely do a guided tour of the old medina of Fes, where the streets are so narrow it is difficult to even fit through some of them. The best part is that locals still live here so you get a really cool local vibe while traversing the alley ways. A day trip up to Chefchaouen is highlight not to be missed. 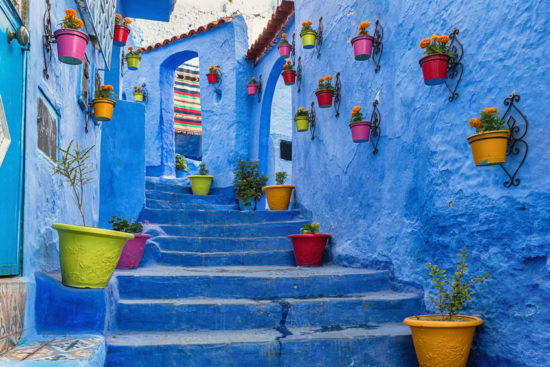 Considered one of the prettiest towns in Morocco, an artsy, blue-washed mountain village that feels like its own world and simply a fun place to get lost while exploring the small streets dotted with great shops and local eateries.